On Wednesday next, the grassy sward above the rocky shore at Borreraig will see the unveiling of a monument to the MacCrimmons of Skye. 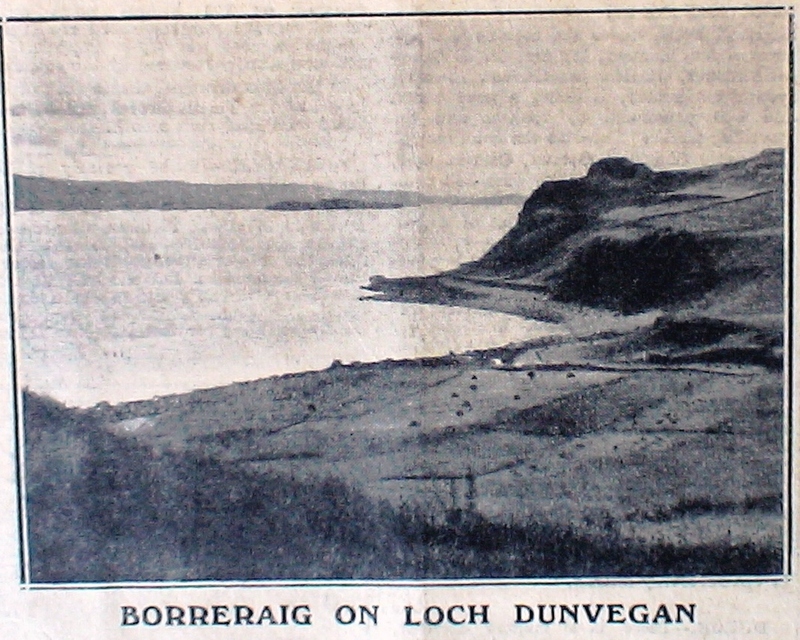 Borreraig is on the south side of Loch Dunvegan, and is in view from the Castle, the home of the MacLeod Chiefs, to whom the MacCrimmons were the hereditary pipers. As is well known in the Highlands, the musical genius descended from father to son in this family, and a piping college was founded at Borreraig to which young man from all parts came for tuition. It is on record that Alastair Crottach, the eighth Chief (from 1480 to1540), gave the islands of Borreraig to a MacCrimmon, which the family held until 1770. In the rent-roll of Dunvegan they appear as holding Galtrigel in 1664. Fionnladh a Bhreacain; Iain Odhar; Padruig Caogach; Padruig Og; Domhnull Mor; Padruig Mor; Padruig Og; Domhnull Ban; Aonghas Og; Calum; Iain Dubh; Padruig Mor my Dheireadh (the last). Fionnladh was born about the middle of the 15th century, and little is known of Iain Odhar, although he appears as the first of the hereditary pipers and Skye, according to Iain Dubh’s version given in Captain Neil MacLeod’s book. The supreme place in this famous family of pipers and composers may be given to Padruig Mor. He was piper to Iain Breae, the sixteenth chief of the MacLeods, who lived in the stirring times of the seventeenth century, when Charles I was dethroned, when Cromwell ruled, when civil war raged, when the Stuart monarchy was restored and again lost. An cogadh, no ‘n sith, cha till e tuilleadh. was the composition of Donald Ban, and it may be called the swan-song of the MacCrimmons. Donald, by prophetic dream, never returned from the expedition in 1745, which ended in the rout at Moy. The choice of the site for the Memorial at Borreraig is a fitting acknowledgment of the debt which piping owes to the MacCrimmons. If it is permissible to single out any body which in modern times has excelled in maintaining the standard of pipe music, credit is due to the Piobaireachd Society. The MacCrimmon College, modest according to present-day ideas, was at Borreraig, but as the playing of piobaireachd is for out-of-doors, the green sward was the class-room, and the cave the practice-hall during stormy weather. To the latter, Uamh nan Piobairean, the MacCrimmons, it is said, retired to find inspiration for their masterly compositions. Borreraig in Skye is the home and cradle of the piobaireachd. The Memorial Cairn to the MacCrimmons, of whom ten generations were the hereditary pipers of MacLeod, and who were renowned as composers, performers and instructors of the classical music of the bagpipe. Near this spot stood the MacCrimmon School of Music. This tribute is eloquent in its brevity. This tablet is erected to commemorate the MacCrimmons, of whom ten generations are interred in this place. They were the hereditary pipers of MacLeod, and for a period of three centuries were distinguished for their gifts as composers, performers and instructors of the classical music of the bagpipe.